Join us on September 28 for an educational field day at the University of Florida and The Holly Factory Nursery (Alachua), where the largest denitrification bioreactor in the world was recently built. UF/IFAS Extension and collaborators at Desert Ranch Institute (DRI) will discuss and demonstrate the use of bioreactors as a low-cost, effective approach to remove nitrogen from agriculture and urban stormwater. Denitrification bioreactors are constructed by stimulating a bacterial process that removes nitrogen, and prevents eutrophication. This is a form of bioremediation. Using readily available equipment and waste sawdust, a bioreactor was installed at The Holly Factory in 2009. Almost a decade later, it is still removing 93% of nitrogen. 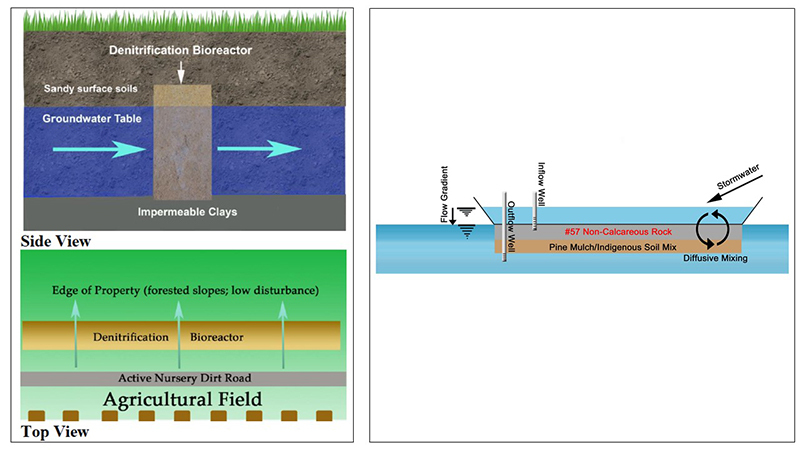 Bioreactors are increasingly being installed in stormwater ponds, exfiltration trenches, in tile drainage, and even to pump and treat portions of the aquifer. The denitrification bioreactor installed in 2009 was recently expanded at The Holly Factory to evaluate the potential to capture nitrogen discharges at a meaningful scale to reduce nitrogen loads to the Santa Fe River. The results of a GIS analysis indicate the potential to expand this treatment approach throughout the Santa Fe watershed. During this field day, we will discuss the installation, challenges, results, and opportunities of this approach, and you will learn how bioreactors can be used to treat water in a variety of situations. The field day will begin at the University of Florida (McCarty Hall A, Room 3177) from 9 – 11:15 AM. We will then proceed to the field site, located at The Holly Factory nursery. This is a brown-bag field day; lunch will not be provided, so please bring your own. The event is free to attend, but you must RSVP. The campus event is limited to the first 20 people, and the field visit is limited to the first 30 people. If you are only planning to attend the field event, please let us know. Please RSVP by completing the registration form. Construction of Denitrification Bioreactor Sequence. Generally scaling up from mixing of the treatment media, to excavating, and installing treatment media, scaling up to whole property, then whole watershed. Contact: Casey Schmidt, DRI (cschmidt@dri.edu) and Mark Clark, UF/IFAS Soil and Water Sciences Department (clarkmw@ufl.edu).